2019 will be the 9th season for the Big Apple Browns Backers, the largest Cleveland Browns Backer location in New York City and arguably one of the most exciting chapters in the entire country. We’re also also a NYC Cavs bar and NYC Indians bar for all playoffs games, with over 500+ rabid fans in attendance. Any given NFL Sunday, we get 200+ fans in NYC shouting at the game while cursing the ghost of Art Modell. We’ve worked hard to build an amazing community of Cleveland fans living in NYC and hope you can join us. We’ve got delicious food & drink specials and only show the Browns games. No other games, no other fans! 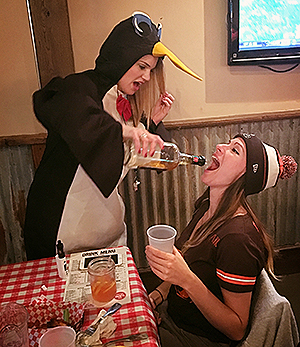 You’ll also experience plenty of game day hi-jinks, including our beloved Shot Penguin (who runs around with bottles of Fireball at the start of the second half). If you haven’t already, please follow us on: Facebook, Instagram and Twitter to stay in the loop with Chapter news and relevant updates for our Browns, Cavs and Indians watch-parties. You can also officially join our chapter. It’s 100% free and takes 5 mins to join through the Browns Backers Worldwide website.